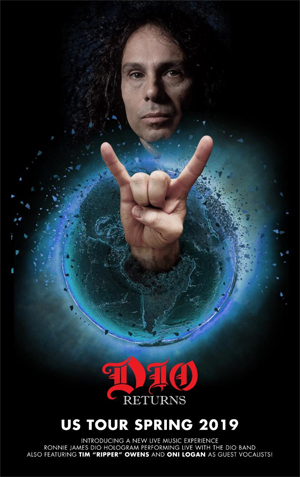 KNAC.COM - News - DIO Hologram Tour Comes To The U.S. The most buzzed-about tour in the heavy metal world - the DIO RETURNS Tour featuring the Ronnie James Dio hologram - is finally coming to the United States this spring and summer! The DIO RETURNS U.S. Tour will feature a line-up of DIO bandmembers of 17 years performing aside the stunning Ronnie James Dio hologram. The official band line-up will feature Craig Goldy on guitar, Simon Wright on drums, Scott Warren on keyboards, and newer DIO family member Bjorn Englen on bass. The show will also feature renowned metal vocalists Tim 'Ripper' Owens (JUDAS PRIEST/YNRWIE MALMSTEEN) and Oni Logan (LYNCH MOB). This 90-minute celebration of Ronnie James Dio will include all of the great fan favorites - such as "Holy Diver", "King of Rock N' Roll" and "We Rock" - taking fans on a DIO journey from RAINBOW to BLACK SABBATH, to his own DIO material - with the legend himself! The DIO RETURNS Tour will begin May 31, 2019 in Ft. Myers, FL and visit a month's-worth of cities, with more dates set to be announced. Simon Wright says, "Looking forward to hitting the road with this incredible piece of technology and celebrating Ronnie and his timeless music again with his friends and fans." For the past year, the presenting team at Eyellusion have been perfecting the production and unbelievable visual effects behind the amazing new Ronnie James Dio hologram. Watch a new trailer of the hologram in action below. Jeff Pezzuti, CEO of Eyellusion says, "Ronnie James Dio was not only known for his amazing vocals, but also his incredible stage shows and performances. This show is a must see for all fans of Ronnie, new and old. The new stage production we have created plus the brand new Ronnie James Dio hologram have to be seen to be believed. This is a first of its kind metal show! We are celebrating Ronnie, with his live vocals, with his band he toured with for the last 17 years, and with a show that his fans will love! It's an over the top metal experience that will have the fans raising their horns throughout the show! We are excited for everyone to see what we have in store for the U.S. beginning on May 31 and the world to follow!" For more information on the DIO RETURNS U.S. Tour 2019, please visit www.ronniejamesdio.com, or the social media sites below.